I usually don’t put a huge amount of stock in the “need” to show certain kinds of tropes in a trope-based block, but I do like that X marks the spot on at least two cards from the world of Ixalan. 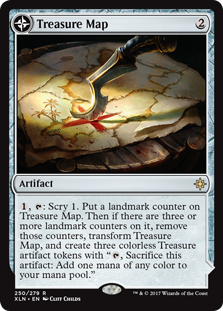 Usually, we’d be justifiably wary of a card that took three turns to do its big thing, but Treasure Map gives you something very useful along the way. Its card selection obviously looks at fewer cards than Crystal Ball, but it adds up to much more than it looks, and every deck can benefit from it. On top of that, three Treasure tokens in a single burst is a big deal. According to my calculations, the earliest you can get this to transform without using any other cards is turn five. That’ll give you enough mana – depending on what other mana producers you might have – for the likes of Maelstrom Wanderer, Akroma, or a mid-range Eldrazi. And you can even play it in a very different style of deck, revolving around Treasure tokens and drawing a free(ish) card each turn. That’s the kind of versatility and power that makes for a future casual all-star. Everyone loves treasure, right? And Treasure Map is a way to get treasure (eventually). The investment is reasonable (5 mana over 3+ turns), and you get to scry 1 thrice en route there. 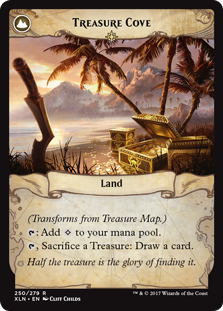 The payoff is that Treasure Map flips into a land (Treasure Cove) that can turn your treasures into card draw if you have enough mana already. Which actually has a card it pairs excellently with in Smothering Tithe from Ravnica Allegiance, come to think of it…it shores up white’s weakness (card draw) while potentially taxing the heck out of your opponents. It’s a bit of a bit player in most decks, but Treasure Map can help get you places if you’re willing to do a bit of legwork to get there.